I’ve tried a *lot* of gadgets and devices recently which can be used to read Ebooks. The good news is that a decent basic ebook reader can be bought in Australia for as little as $150. 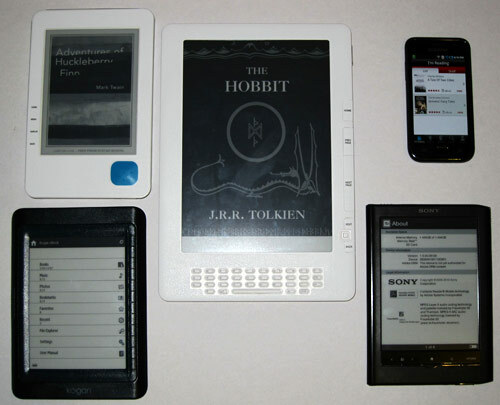 All of the devices in the photo below (Amazon Kindle DX, Kobo reader, Sony Reader Touch Edition, Samsung Galaxy S android smartphone with Borders ebook application and Kogan ebook Reader) as well as others like the Apple iPad have strengths accompanied with flaws. Which ebook reader device you buy depends on the flaws you can live with. In my opinion of the 6 best ebook reading options available to Australians at the moment Amazon offers 3, Kobo offers 2 and Samsung has 1. Amazon offers the 6″ inch Kindle and 9.7″ inch Kindle DX. The cheaper 6″ inch Kindle can only connect to the Kindle bookstore via WiFi, the slightly more expensive 6″ inch Kindle 3G and 9.7″ inch Kindle DX have a builtin mobile SIM card so they can access the Kindle bookstore anywhere around the world if they can pick up a compatible mobile signal. Amazon has improved the Kindle a lot since it was first launched in 2007. They’ve managed to perfect the experience of requesting and reading a free sample chapter from the Kindle store and buying the whole book directly from the device on a whim. At $US139+shipping for the paperback sized 6″ WiFi version it’s my favourite budget ebook reader and the $US379 9.7″ inch DX model which has a bigger screen more like an A4 page is the best high end eInk ebook reader available at the moment. Your collection of books purchased from the Kindle store can also be automatically synchronised and read by you using the Kindle application on Android, iPhone, iPad and Blackberry devices. Kindle versions of really old out of copyright books are priced at few dollars to buy in order to subsidise the cost Amazon incurs from international mobile network data transfers through the included 3G mobile simcard on the premium 6″ and 9.7″ DX models. The first generation Kobo eReader is sold in Australia by Borders and Angus & Robertson shops and on their websites for $179. The Kobo relies on side-loading books via a PC or laptop with a USB cable or a smartphone via Bluetooth, but has the edge over the Kindle by allowing you to load any of the freely available two-million-plus ePub format older books at no cost. As an example “The Sea Wolf” by Jack London is an out of copyright book which costs $2 to buy via a Kindle’s 3G connection to the Amazon store, but comes free pre-loaded on the Kobo along with 99 other classic books. Your collection of books purchased from the Kobo store can also be automatically synchronised and read by you using the Kindle application on Android, iPhone, iPad and Blackberry devices. The clicky noise made by the navigation button, some people find it annoying. This may seem a strange choice considering the iPad and other smartphones can also be used to read eBooks. The reason I think the Samsung Galaxy S is the best option out of all the smartphones and tablets is because of it’s 4″ inch Super AMOLED screen which is 0.5″ larger than the recently released iPhone 4 and is capable of displaying the best true black background of any portable device I have tested. This means you can install an ebook reader application on the phone like the Borders Kobo app, open a book, invert the background so it shows white text on a black background and it’s far easier for your eyes to read so it doesn’t cause eyestrain. There are some limitations though, in my opinion at 4″ inches the screen is OK to read for a short bus or train trip etc but not for a whole book. Also because the phone is a multi-function device it’s quite likely you could be interrupted several times by calls, sms or social media messages from Twitter/Facebook etc. The benefit of dedicated ebook reader devices like the Kindle and Kobo is they won’t interrupt you from concentrating on the book. PS for those interested in the topic, I’ve previously written about the bigger topic of What Is A Book? How Will We Read Books In the Future? Thanks for the review. i finally took the e-book reader plunge last week and got myself a Kindle. I have nothing but good things to say about it. Well this is a very impressively alternative review. Might be worth talking about the free 3G, battery life and screen readability/visibility a bit more. But maybe it is just me who is interested in these metrics. EDITOR: im writing a big feature article about ebooks for the end of 2010 issue of GEARE magazine so not as much detail in this blogpost. That said you are right the eInk ebook readers all have the advantage of weeks of battery life and clear screen visibility in low light all the way to reading outside under the midday sun. Just like to point out that your review does not seem to cover a lot of detail. For one, the faults about the kobo. The case ‘loosens’ after a while and if you hold it with one hand you can hear it creak. The 8000 page turns is totally rubbish. I’ve only ever managed to get around 3500 page turns after exchanging 2 kobo’s. This was done in one or two sittings, so power used in standby was minimal so as to not skew the results. The tech support in Australia (Borders staff) did not have a clue about the device AT ALL and all support is done through Kobo (Canada’s hotline) which is pretty good. The white kobo gets really dirty fast. Go look at the kobo’s on display at Borders. I’m not sure how they expect to sell any of the white kobo’s when all the blue trackpads have become brown. One of the most important weaknesses, is the SLOWNESS of page turns. If you have used the 3rd Generation Kindle this would be apparent immediately. The button placement is also horrible. If your a massive reader like me, you’ll find your hand starts to ache after awhile if your holding it one handed. This is due to the fact the buttons are placed at the bottom, and to hold it with one hand, you’ll be holding it away from its centre of mass, putting more force on your hand, from the resulting torque. Upsides i found with the kobo are the bookshelf view, allowing if i remember correctly 16 book covers to be displayed on the screen. Also on standby it shows the cover of your book on your screen. The Kindle 3 on the other hand is a superb device to use. Buttons are on the side, so you can easily hold it in its centre of its mass saving your hands from muscle strain after a few hours. It is also exceptionally light and thin. The new Pearl eink screens provide better contrast then the Kobo, and page turns are much much much much much snappier. Its almost the same price as the Kobo, (Kobo was actually more expensive when the Kindle 3 Launched). It’s also cheaper then the Sony’s but they have touch screens and are a different animal altogether. Has a very intuitive store which you can access over wifi. DOES NOT charge you to download books out of copyright and under the Creative Commons. Has a search capability, and indexes all your books really fast. Collections (think folders you create) are backup through wifi to Amazon. It also has a much bigger community producing ‘hacks’ such as more fonts and more wallpapers. It’s battery life is much longer then the kobo with wifi turned off. And possibly not using it as a mp3 player that much. Downsides are that you can’t change the wallpapers when it goes to sleep without hacking it. Its experimental web browsing is as detailed; experimental. So is the mp3 player, it does not have a list of your music and little or no options. (You have skip, start and stop). Its memory isn’t expandable like the Kobo or the Sony, but you do have 4 gigs. So yes, i feel sufficiently disappointed with the Kobo at its price, to justify typing this post. EDITOR: thanks for that detailed Feedback. I’ve only read short books on the Kobo and not experienced any technical issues. The 3G Kindle DX i have does charge me to download books out of copyright from the Kindle Store. Can you confirm your WiFi Kindle 3 doesn’t do that? How have you found the bookstores? I was looking at getting the 6″ wifi Kindle but the lack of books available in Australia really put me off. I am disappointed you did not include or even mention the Foxit E-slick ebook. It runs very well and can read most formats. Maybe you could assess it and add it to your already reasonable list of Ebook readers. I find it frustrating the Kindle is the default reader when there are many out there that are not hampered by DRM. Thank you very much for this review, I want to but the Samsung Galaxy Tablet and search as many information I can find. As for amount of books, the Kindle has 460,000 books on its store as the Kindle has been selling for years. I d not believe Borders have anywhere that many. That said you can purchase Kobo ebooks, strip the drm, convert with calibre and read on the Kindle. What do you think about the option of using the iPad or iPhone as a mobile book reader? I have a Kindle DX and am very happy with it; particularly as I have eye problems I need to have larger font sizes than the normal book. Kindle is one of the few readers that do that and also you can switch to a computer voice to read the book for you. My problem with kindle is Australian publishers prevent the sale of many suitable ebooks, particlarly direct from Amazon by radio. Their are methods which can be used to overcome this problem for some books but the technology is not easy to use at my age. I like the sony. It is touch screen and very easy to use. I just purchased it last month and it works fine so far. i travel always and I need to have an ebook reader while i am on the plane. Book lover here! Thanks for the post! I own a kindle and it is very good. Easy to use and good battery life. The Kindle DX is remarkably easy to use. It’s nice to find a gadget that does a great job without being ridiculously complicated. Unfortunately it might be a little TOO simple. With the potential to store over 3,000 books it’s really necessary to have some way to organize things – even just the ability to put books into categories would be a huge help. I received two ebooks for my birthday. The Sony 650 touch edition and the kobo wifi 6inch. Which one should I keep? EDITOR: tough question. The Sony looks better and has a touchscreen but its only connectivity is a cable to your computer, no mobile phone apps. The Kobo is not as fashionable, not touchscreen but lets you download books anywhere with WiFi and has apps you can read the same books with on iPhone, iPad, Blackberry and Android devices. You missed an important ebook reader – Sony eReader. It is miles ahead of rest right now, but Kindle and rest will overtake Sony soon. I love my kindle 3!! I like how they made the screen look almost like real paper to reduce glare and eye tiredness and you can not beat the book selection. I am looking at purchasing an eBook reader for my mother86. The local library doesnt supply much in the way of eBooks but what it has is pdf/epub format yet, reading the above comments, it would appear the Kindle is the better brand. She averages 5 books a week and, even at $6/book from Amazon, this is an expensive ongoing expense for a pensioner. Any suggestions?